In advance of Bill Plympton’s feature film REVENGEANCE opening at the IFC Center on August 3, we’re excited to be playing his latest shorts for the New York Times Opinion section, “Trump Bites,” in select preshows. Every day, Donald Trump unleashes a torrent of exaggerations, insults, threats, and self-pity. What’s going on inside that fevered brain? 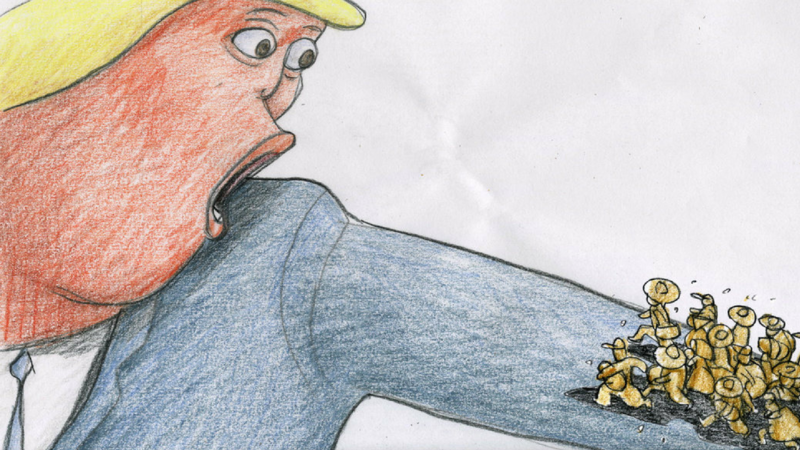 Trump Bites is a series of short animated fantasies based on actual Donald Trump audio clips, hand-drawn by Academy Award nominee Bill Plympton. It’s the brainchild of producers Billy Shebar and David Roberts of 110th Street Films. Supporters can endorse their efforts to produce more Trump Bites via tax-deductible donations.